Booklets: "Messages from St. Thomas Aquinas on the Chambers of the United Hearts". 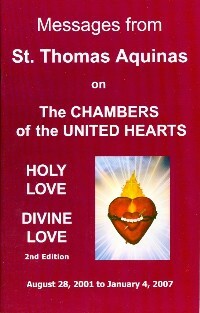 Booklet: Messages from St. Thomas Aquinas on the Chambers of the United Hearts, Second Edition. St. Thomas Aquinas speaks about the Chambers of the United Hearts as a school of theology with concise paths towards salvation and union with God. He discusses what hinders the soul on its journey, temptation, spiritual blindness, the close alliance of the United Hearts Revelation and the new dogma, prayer of the rosary, prayer and its cumulative effect, trustful surrender, sanctity, and the perfection of love in heaven. Front cover measures 5 x 7 in.